Corsicana is a city in Navarro County, Texas, United States. It is located on Interstate 45, some 58 mi south of downtown Dallas. The population was 23,770 at the 2010 census. It is the county seat of Navarro County. After graduating from high school, Yates attended Texas A&M University beginning in 1999. He was a reserve offensive lineman in his first two seasons, but started 20 games over his junior and senior seasons in 2001 and 2002. Yates was signed as an undrafted free agent after the 2003 NFL Draft by the Miami Dolphins. He made the Dolphins' 53-man roster out of training camp and saw action in three games as a reserve in 2003. He was waived by the Dolphins on September 5, 2004. Yates was signed to the practice squad of the New England Patriots on September 11, 2004, where he spent the remainder of the regular season and playoffs until being activated for Super Bowl XXXIX. He also began the 2005 season on the Patriots' practice squad before being activated on November 12 following the loss of starting center Dan Koppen for the season. He was a reserve offensive lineman for the remainder of the season and playoffs, while also seeing time on kickoff coverage units. In sports, the practice squad, also called the taxi squad or practice roster, is a group of players signed by a team but not part of their main roster. Frequently used in American and Canadian football, they serve as extra players during the team's practices, often as part of the scout team by emulating an upcoming opponent's play style. Because the players on the practice squad are familiar with the team's plays and formations, the practice squad serves as a way to develop inexperienced players for promotion to the main roster. In addition, it provides replacement players for the main roster when players are needed as the result of injuries or other roster moves, such as bereavement leave. The 2005 New England Patriots season was the franchise's 36th season in the National Football League, the 46th overall and the 6th under head coach Bill Belichick. They finished with a 10–6 record and the division title before losing in the playoffs to the Denver Broncos, ending their hopes of becoming the first NFL team to three peat in the Super Bowl. Yates began yet another season on the practice squad for the Patriots in 2006, but was activated on October 21 and a game later made his first start on October 30, 2006, against the Minnesota Vikings in place of an injured Stephen Neal. He would go on to start the Patriots' next two games at right guard but was injured in the second against the New York Jets and was placed on injured reserve, missing the remainder of the season with a broken leg. Yates, for the first time with the Patriots, made the 53-man roster to open the 2007 season; he started the second game of the year against the San Diego Chargers, his only start of the year. He was released on September 4, 2009. Yates was signed by the Cleveland Browns on September 16, 2009. He played in seven games during his first season with the Browns, but started none. On August 15, 2011, Yates announced his intent to retire from football. Stephen Matthew Neal is a former American football guard who played his entire career for the New England Patriots of the National Football League. He is a former world champion in freestyle wrestling, national champion amateur and collegiate wrestler at Cal State-Bakersfield. He was signed by the Patriots as an undrafted free agent in 2001, and won three Super Bowl rings with the team. He is one of a handful of NFL players who did not play college football. David Patten is a former American football wide receiver. He was signed by the Albany Firebirds as a street free agent in 1996. He played college football at Western Carolina. Artis Hicks is a former American football guard of the National Football League. He was signed by the Philadelphia Eagles as an undrafted free agent in 2002. He played college football at Memphis. Philip Kenwood "P. K." Sam, II is a former professional gridiron football wide receiver. He last played for the Toronto Argonauts of the Canadian Football League. He was drafted by the New England Patriots in the fifth round of the 2004 NFL Draft. He played college football at Florida State. Damon Paul Huard is a former American football quarterback. He is the director of community relations and fundraiser for the University of Washington football program, his alma mater. Eric Vonkey Alexander is a former American football linebacker in the National Football League (NFL). He was signed by the New England Patriots as an undrafted free agent in 2004. He also played for the Jacksonville Jaguars and Cleveland Browns. He played college football at Louisiana State University for the LSU Tigers football team. Gene Vincent Mruczkowski is a former American football guard. He was signed by the New England Patriots as an undrafted free agent in 2003. He played college football at Purdue. Daniel Paul Connolly is a former American football player. He was signed by the Jacksonville Jaguars as an undrafted free agent in 2005 after playing college football at Southeast Missouri State. Connolly played eight seasons for the New England Patriots, winning Super Bowl XLIX over the Seattle Seahawks in his final season. Mark Jacob LeVoir is a former American football offensive tackle. He was signed by the Chicago Bears as an undrafted free agent in 2006. He played college football at Notre Dame. Raymond "Bubba" Ventrone is a former American football safety and current special teams coach for the Indianapolis Colts of the National Football League (NFL). He was signed by the Patriots as an undrafted free agent in 2005. He played college football at Villanova. Kyle Chandler Arrington Sr. is an American football cornerback who is currently a free agent. He was signed by the Philadelphia Eagles as an undrafted free agent in 2008. He played college football at Hofstra. Arrington has also played for the Tampa Bay Buccaneers, New England Patriots and Baltimore Ravens. Ryan Robert Wendell is a former American football center who played his first eight seasons with the New England Patriots of the National Football League (NFL). He was signed by the Patriots as an undrafted free agent in 2008. He played college football at Fresno State. He has also played for the Carolina Panthers. Tupaimoefitpo "Sealver" Siliga is an American football defensive tackle for the Salt Lake Stallions of the Alliance of American Football (AAF). He played college football at Utah. Derrick Shelby is an American football defensive end who is currently a free agent. He was signed by the Miami Dolphins after going undrafted in 2012. He played college football at Utah. Brian Edward Tyms is an American football wide receiver for the Salt Lake Stallions of the Alliance of American Football (AAF). He played college football at Florida A&M. He signed with the San Francisco 49ers as undrafted free agent in 2012. He has also been a member of the Miami Dolphins, Cleveland Browns, New England Patriots, and Indianapolis Colts, as well as a pair of teams in the Canadian Football League. Josh Boyce is an American football wide receiver who is currently a free agent. He was drafted by the New England Patriots in the fourth round of the 2013 NFL Draft. He played college football at TCU. James Rittenhouse Develin, Jr. is an American football fullback for the New England Patriots of the National Football League (NFL). He played college football for Brown University as a defensive end. 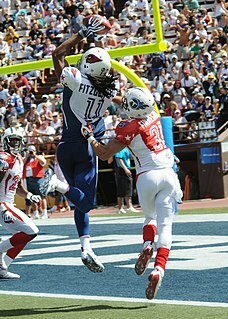 He was originally signed as an undrafted free agent by the Oklahoma City Yard Dawgz of the Arena Football League (AFL). He also played for the Cincinnati Bengals and for the Florida Tuskers of the United Football League (UFL). Chris Barker is an American football offensive guard who is currently a free agent. He played college football at Nevada. He was signed by the Miami Dolphins as an undrafted free agent in 2013. Caylin Hauptmann is an American football offensive lineman who is currently a free agent. He signed with the Cleveland Browns as an undrafted free agent in 2013. He was signed to the Seattle Seahawks in September 2013. ↑ "Signing Day '98: Billy Yates". Archived from the original on 2005-12-24. ↑ Reiss, Mike (2009-02-19). "Billy Yates set to re-sign with Patriots". Boston.com Reiss' Pieces. Retrieved 2009-08-29.